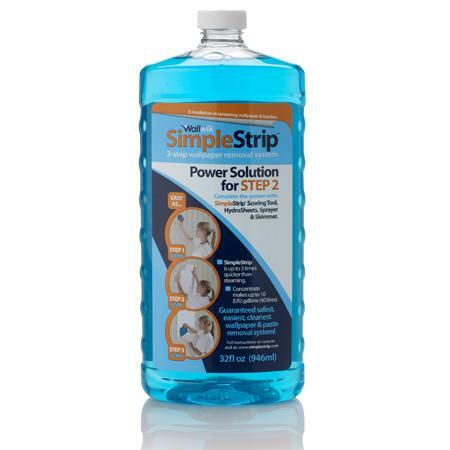 Product description:The NEW SimpleStrip Power solution is a high performance paste dissolving formula that dissolves adhesive paste within minutes. SimpleStrip Power uses environmentally friendly and safe biodegradable detergents and enzymes which actively break down and rehydrate wallpaper adhesive. The safe formula can be used around children and pets. Pack details: The 32 fl.oz (946ml) bottle makes up to 8 Gallons of Wallwik Power solution. That is enough to strip 2 14 x 14ft rooms. Multi-purpose SimpleStrip Power can be used as a wallpaper stripper, wall wash or to remove vinyl on vinyl adhesive.